Karen Lewis stopped short of making any big announcements at a Southwest Side stop on her "Conversations with Karen" tour. 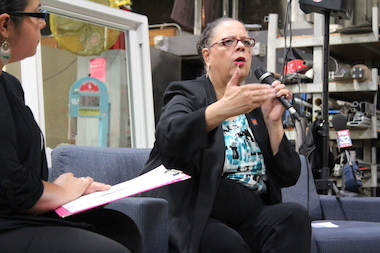 MCKINLEY PARK — Karen Lewis stopped short of making any big announcements at a Southwest Side stop on her "Conversations with Karen" tour. But the potential mayoral candidate did tell the crowd that packed into a factory on Monday that the era of top-down decision making at City Hall could soon come to an end. "That's what the 21st century is supposed to hold for us. It's supposed to hold the end to the old divisions and a way to come together in coalitions and in dealing with things that are important to us all," she said at the event, held at New Era Windows, a worker-owned cooperative at 2600 W. 35th St.
"I honestly believe this city could work for everyone in it, not just a few, and that the rest of us just have to deal with what crumbs are left over." Although Lewis has parked $40,000 of her own money in an campaign exploratory committee, she has not formally announced her bid for mayor. But that didn't stop the crowd from chanting "Run Karen Run" at the conclusion of Monday's forum. So far, Ald. Bob Fioretti (2nd) has launched his candidacy and lesser-known candidates Amara Enyia and Frederick Collins have tossed their hats in the ring. Organized by the McKinley Park Progressive Alliance, Monday's event was designed for Southwest Side residents to tell Lewis about ward-specific issues but it turned into a Q-and-A with the firebrand leader of the Chicago Teachers Union. Lewis, seated on a sofa on the factory floor, fielded questions about economic development, charter schools, auditing the city's Tax Increment Financing districts and finding ways to solve the city's estimated $27 billion shortfall, like the so-called "La Salle Street Tax" that would tax financial transactions handled on the city's exchanges. Asked what her plan would be to quell the gang and gun violence in the city, Lewis quickly retorted, saying "there is no plan." "There is no plan because if there was a plan, it would've been done already. But here's what I know: In communities where there's high instances of violence, there's also double-digit unemployment. There are a lack of wraparound services in those schools. These are the same areas where mental health clinics have been closed down. "So the issue becomes how do we invest appropriately ... in our children and our adults? The key is that if we don't have real jobs, a minimum wage that could feed a family, then we're going to see frustration, anger and violence taken out. So my plan is that we need to have a comprehensive plan to deal with all these other issues." To begin to accomplish that, Lewis said she would call for the "restoration of participatory democracy," giving Chicago residents a voice in everything from the Board of Education's annual budget to the city's annual budget. "Instead of giving us something and saying "Here's what it is, comment on it and we're going to do what we do anyway, [let's have] participatory budgeting. Again, democracy, what a concept."